Apoptosis is an ordered and orchestrated cellular process that occurs in physiological and pathological conditions. It is also one of the most studied topics among cell biologists. An understanding of the underlying mechanism of apoptosis is important as it plays a pivotal role in the pathogenesis of many diseases. In some, the problem is due to too much apoptosis, such as in the case of degenerative diseases while in others, too little apoptosis is the culprit. Cancer is one of the scenarios where too little apoptosis occurs, resulting in malignant cells that will not die. The mechanism of apoptosis is complex and involves many pathways. Defects can occur at any point along these pathways, leading to malignant transformation of the affected cells, tumour metastasis and resistance to anticancer drugs. Despite being the cause of problem, apoptosis plays an important role in the treatment of cancer as it is a popular target of many treatment strategies. The abundance of literature suggests that targeting apoptosis in cancer is feasible. However, many troubling questions arise with the use of new drugs or treatment strategies that are designed to enhance apoptosis and critical tests must be passed before they can be used safely in human subjects. Cell death, particularly apoptosis, is probably one of the most widely-studied subjects among cell biologists. Understanding apoptosis in disease conditions is very important as it not only gives insights into the pathogenesis of a disease but may also leaves clues on how the disease can be treated. In cancer, there is a loss of balance between cell division and cell death and cells that should have died did not receive the signals to do so. The problem can arise in any one step along the way of apoptosis. One example is the downregulation of p53, a tumour suppressor gene, which results in reduced apoptosis and enhanced tumour growth and development  and inactivation of p53, regardless of the mechanism, has been linked to many human cancers [2–4]. However, being a double-edged sword, apoptosis can be cause of the problem as well as the solution, as many have now ventured into the quest of new drugs targeting various aspects of apoptosis [5, 6]. Hence, apoptosis plays an important role in both carcinogenesis and cancer treatment. 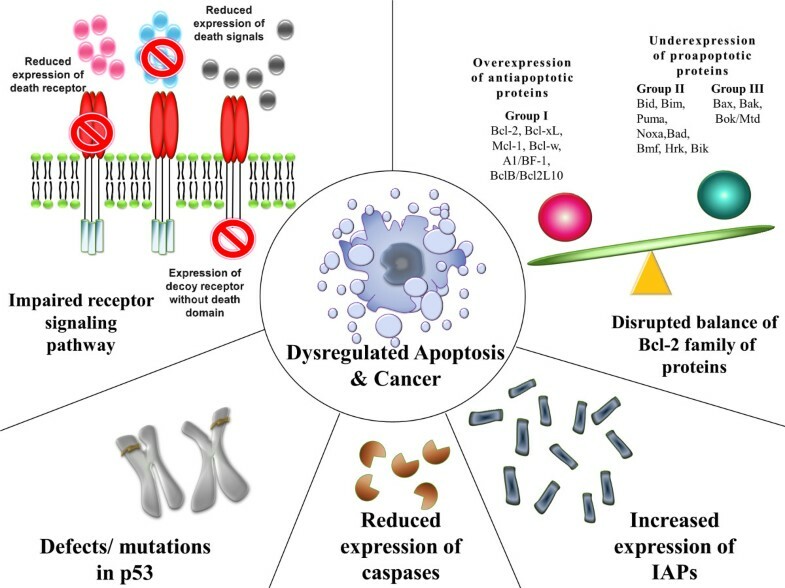 This article gives a comprehensive review of apoptosis, its mechanisms, how defects along the apoptotic pathway contribute to carcinogenesis and how apoptosis can be used as a vehicle of targeted treatment in cancer. The term "apoptosis" is derived from the Greek words "απο" and "πτωσιζ" meaning "dropping off" and refers to the falling of leaves from trees in autumn. It is used, in contrast to necrosis, to describe the situation in which a cell actively pursues a course toward death upon receiving certain stimuli . Ever since apoptosis was described by Kerr et al in the 1970's, it remains one of the most investigated processes in biologic research . Being a highly selective process, apoptosis is important in both physiological and pathological conditions [9, 10]. These conditions are summarised in Table 1. Morphological alterations of apoptotic cell death that concern both the nucleus and the cytoplasm are remarkably similar across cell types and species [11, 12]. Usually several hours are required from the initiation of cell death to the final cellular fragmentation. However, the time taken depends on the cell type, the stimulus and the apoptotic pathway . Morphological hallmarks of apoptosis in the nucleus are chromatin condensation and nuclear fragmentation, which are accompanied by rounding up of the cell, reduction in cellular volume (pyknosis) and retraction of pseudopodes . Chromatin condensation starts at the periphery of the nuclear membrane, forming a crescent or ring-like structure. The chromatin further condenses until it breaks up inside a cell with an intact membrane, a feature described as karyorrhexis . The plasma membrane is intact throughout the total process. At the later stage of apoptosis some of the morphological features include membrane blebbing, ultrastrutural modification of cytoplasmic organelles and a loss of membrane integrity . Usually phagocytic cells engulf apoptotic cells before apoptotic bodies occur. This is the reason why apoptosis was discovered very late in the history of cell biology in 1972 and apoptotic bodies are seen in vitro under special conditions. If the remnants of apoptotic cells are not phagocytosed such as in the case of an artificial cell culture environment, they will undergo degradation that resembles necrosis and the condition is termed secondary necrosis . Broadly, three main types of biochemical changes can be observed in apoptosis: 1) activation of caspases, 2) DNA and protein breakdown and 3) membrane changes and recognition by phagocytic cells . Early in apoptosis, there is expression of phosphatidylserine (PS) in the outer layers of the cell membrane, which has been "flipped out" from the inner layers. This allows early recognition of dead cells by macrophages, resulting in phagocytosis without the release of pro-inflammatory cellular components . This is followed by a characteristic breakdown of DNA into large 50 to 300 kilobase pieces . Later, there is internucleosomal cleavage of DNA into oligonucleosomes in multiples of 180 to 200 base pairs by endonucleases. Although this feature is characteristic of apoptosis, it is not specific as the typical DNA ladder in agarose gel electrophoresis can be seen in necrotic cells as well . Another specific feature of apoptosis is the activation of a group of enzymes belonging to the cysteine protease family named caspases. The "c" of "caspase" refers to a cysteine protease, while the "aspase" refers to the enzyme's unique property to cleave after aspartic acid residues . Activated caspases cleave many vital cellular proteins and break up the nuclear scaffold and cytoskeleton. They also activate DNAase, which further degrade nuclear DNA . Although the biochemical changes explain in part some of the morphological changes in apoptosis, it is important to note that biochemical analyses of DNA fragmentation or caspase activation should not be used to define apoptosis, as apoptosis can occur without oligonucleosomal DNA fragmentation and can be caspase-independent . While many biochemical assays and experiments have been used in the detection of apoptosis, the Nomenclature Committee on Cell Death (NCCD) has proposed that the classification of cell death modalities should rely purely on morphological criteria because there is no clear-cut equivalence between ultrastructural changes and biochemical cell death characteristics . Understanding the mechanisms of apoptosis is crucial and helps in the understanding of the pathogenesis of conditions as a result of disordered apoptosis. This in turn, may help in the development of drugs that target certain apoptotic genes or pathways. Caspases are central to the mechanism of apoptosis as they are both the initiators and executioners. There are three pathways by which caspases can be activated. The two commonly described initiation pathways are the intrinsic (or mitochondrial) and extrinsic (or death receptor) pathways of apoptosis (Figure 1). Both pathways eventually lead to a common pathway or the execution phase of apoptosis. A third less well-known initiation pathway is the intrinsic endoplasmic reticulum pathway . The intrinsic and extrinsic pathways of apoptosis. The extrinsic death receptor pathway, as its name implies, begins when death ligands bind to a death receptor. Although several death receptors have been described, the best known death receptors is the type 1 TNF receptor (TNFR1) and a related protein called Fas (CD95) and their ligands are called TNF and Fas ligand (FasL) respectively . These death receptors have an intracellular death domain that recruits adapter proteins such as TNF receptor-associated death domain (TRADD) and Fas-associated death domain (FADD), as well as cysteine proteases like caspase 8 . Binding of the death ligand to the death receptor results in the formation of a binding site for an adaptor protein and the whole ligand-receptor-adaptor protein complex is known as the death-inducing signalling complex (DISC) . DISC then initiates the assembly and activation of pro-caspase 8. The activated form of the enzyme, caspase 8 is an initiator caspase, which initiates apoptosis by cleaving other downstream or executioner caspases . As its name implies, the intrinsic pathway is initiated within the cell. 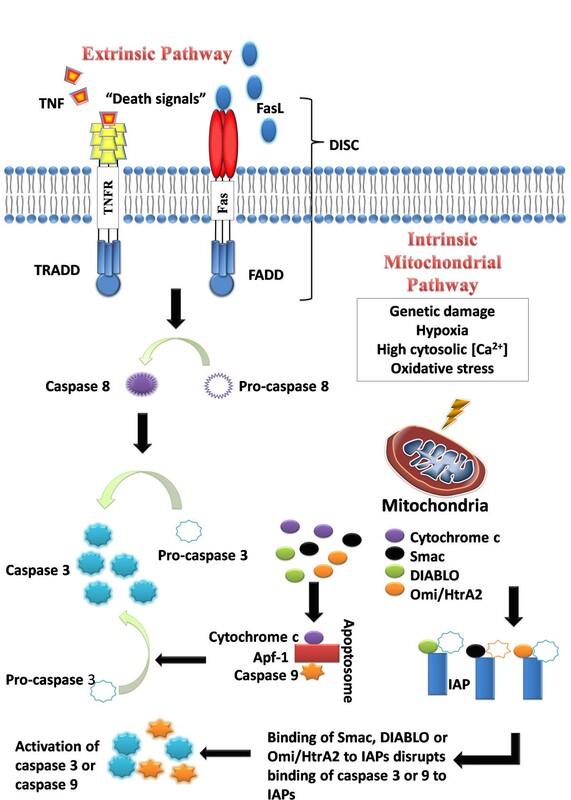 Internal stimuli such as irreparable genetic damage, hypoxia, extremely high concentrations of cytosolic Ca2+ and severe oxidative stress are some triggers of the initiation of the intrinsic mitochondrial pathway . Regardless of the stimuli, this pathway is the result of increased mitochondrial permeability and the release of pro-apoptotic molecules such as cytochrome-c into the cytoplasm . This pathway is closely regulated by a group of proteins belonging to the Bcl-2 family, named after the BCL2 gene originally observed at the chromosomal breakpoint of the translocation of chromosome 18 to 14 in follicular non-Hodgkin lymphoma . There are two main groups of the Bcl-2 proteins, namely the pro-apoptotic proteins (e.g. Bax, Bak, Bad, Bcl-Xs, Bid, Bik, Bim and Hrk) and the anti-apoptotic proteins (e.g. Bcl-2, Bcl-XL, Bcl-W, Bfl-1 and Mcl-1) . While the anti-apoptotic proteins regulate apoptosis by blocking the mitochondrial release of cytochrome-c, the pro-apoptotic proteins act by promoting such release. It is not the absolute quantity but rather the balance between the pro- and anti-apoptotic proteins that determines whether apoptosis would be initiated . Other apoptotic factors that are released from the mitochondrial intermembrane space into the cytoplasm include apoptosis inducing factor (AIF), second mitochondria-derived activator of caspase (Smac), direct IAP Binding protein with Low pI (DIABLO) and Omi/high temperature requirement protein A (HtrA2) . Cytoplasmic release of cytochrome c activates caspase 3 via the formation of a complex known as apoptosome which is made up of cytochrome c, Apaf-1 and caspase 9 . On the other hand, Smac/DIABLO or Omi/HtrA2 promotes caspase activation by binding to inhibitor of apoptosis proteins (IAPs) which subsequently leads to disruption in the interaction of IAPs with caspase-3 or -9 [28, 29]. The execution phase of apoptosis involves the activation of a series of caspases. The upstream caspase for the intrinsic pathway is caspase 9 while that of the extrinsic pathway is caspase 8. The intrinsic and extrinsic pathways converge to caspase 3. Caspase 3 then cleaves the inhibitor of the caspase-activated deoxyribonuclease, which is responsible for nuclear apoptosis . In addition, downstream caspases induce cleavage of protein kinases, cytoskeletal proteins, DNA repair proteins and inhibitory subunits of endonucleases family. They also have an effect on the cytoskeleton, cell cycle and signalling pathways, which together contribute to the typical morphological changes in apoptosis . This intrinsic endoplasmic reticulum (ER) pathway is a third pathway and is less well known. It is believed to be caspase 12-dependent and mitochondria-independent . When the ER is injured by cellular stresses like hypoxia, free radicals or glucose starvation, there is unfolding of proteins and reduced protein synthesis in the cell, and an adaptor protein known as TNF receptor associated factor 2 (TRAF2) dissociates from procaspase-12, resulting in the activation of the latter . Cancer can be viewed as the result of a succession of genetic changes during which a normal cell is transformed into a malignant one while evasion of cell death is one of the essential changes in a cell that cause this malignant transformation . As early as the 1970's, Kerr et al had linked apoptosis to the elimination of potentially malignant cells, hyperplasia and tumour progression . Hence, reduced apoptosis or its resistance plays a vital role in carcinogenesis. There are many ways a malignant cell can acquire reduction in apoptosis or apoptosis resistance. Generally, the mechanisms by which evasion of apoptosis occurs can be broadly dividend into: 1) disrupted balance of pro-apoptotic and anti-apoptotic proteins, 2) reduced caspase function and 3) impaired death receptor signalling. Figure 2 summarises the mechanisms that contribute to evasion of apoptosis and carcinogenesis. Mechanisms contributing to evasion of apoptosis and carcinogenesis. Many proteins have been reported to exert pro- or anti-apoptotic activity in the cell. It is not the absolute quantity but rather the ratio of these pro-and anti-apoptotic proteins that plays an important role in the regulation of cell death. Besides, over- or under-expression of certain genes (hence the resultant regulatory proteins) have been found to contribute to carcinogenesis by reducing apoptosis in cancer cells. The Bcl-2 family of proteins is comprised of pro-apoptotic and anti-apoptotic proteins that play a pivotal role in the regulation of apoptosis, especially via the intrinsic pathway as they reside upstream of irreversible cellular damage and act mainly at the mitochondria level . Bcl-2 was the first protein of this family to be identified more than 20 years ago and it is encoded by the BCL2 gene, which derives its name from B-cell lymphoma 2, the second member of a range of proteins found in human B-cell lymphomas with the t (14; 18) chromosomal translocation . All the Bcl-2 members are located on the outer mitochondrial membrane. They are dimmers which are responsible for membrane permeability either in the form of an ion channel or through the creation of pores . Based of their function and the Bcl-2 homology (BH) domains the Bcl-2 family members are further divided into three groups . The first group are the anti-apoptotic proteins that contain all four BH domains and they protect the cell from apoptotic stimuli. Some examples are Bcl-2, Bcl-xL, Mcl-1, Bcl-w, A1/Bfl-1, and Bcl-B/Bcl2L10. The second group is made up of the BH-3 only proteins, so named because in comparison to the other members, they are restricted to the BH3 domain. Examples in this group include Bid, Bim, Puma, Noxa, Bad, Bmf, Hrk, and Bik. In times of cellular stresses such as DNA damage, growth factor deprivation and endoplasmic reticulum stress, the BH3-only proteins, which are initiators of apoptosis, are activated. Therefore, they are pro-apoptotic. Members of the third group contain all four BH domains and they are also pro-apoptotic. Some examples include Bax, Bak, and Bok/Mtd . When there is disruption in the balance of anti-apoptotic and pro-apoptotic members of the Bcl-2 family, the result is dysregulated apoptosis in the affected cells. This can be due to an overexpression of one or more anti-apoptotic proteins or an underexpression of one or more pro-apoptotic proteins or a combination of both. For example, Raffo et al showed that the overexpression of Bcl-2 protected prostate cancer cells from apoptosis  while Fulda et al reported Bcl-2 overexpression led to inhibition of TRAIL-induced apoptosis in neuroblastoma, glioblastoma and breast carcinoma cells . Overexpression of Bcl-xL has also been reported to confer a multi-drug resistance phenotype in tumour cells and prevent them from undergoing apoptosis . In colorectal cancers with microsatellite instability, on the other hand, mutations in the bax gene are very common. Miquel et al demonstrated that impaired apoptosis resulting from bax(G)8 frameshift mutations could contribute to resistance of colorectal cancer cells to anticancer treatments . In the case of chronic lymphocytic leukaemia (CLL), the malignant cells have an anti-apoptotic phenotype with high levels of anti-apoptotic Bcl-2 and low levels of pro-apoptotic proteins such as Bax in vivo. Leukaemogenesis in CLL is due to reduced apoptosis rather than increased proliferation in vivo. Pepper et al reported that B-lymphocytes in CLL showed an increased Bcl-2/Bax ratio in patients with CLL and that when these cells were cultured in vitro, drug-induced apoptosis in B-CLL cells was inversely related to Bcl-2/Bax ratios . The p53 protein, also called tumour protein 53 (or TP 53), is one of the best known tumour suppressor proteins encoded by the tumour suppressor gene TP53 located at the short arm of chromosome 17 (17p13.1). It is named after its molecular weights, i.e., 53 kDa . It was first identified in 1979 as a transformation-related protein and a cellular protein accumulated in the nuclei of cancer cells binding tightly to the simian virus 40 (SV40) large T antigen. Initially, it was found to be weakly-oncogenic. It was later discovered that the oncogenic property was due to a p53 mutation, or what was later called a "gain of oncogenic function" . Since its discovery, many studies have looked into its function and its role in cancer. It is not only involved in the induction of apoptosis but it is also a key player in cell cycle regulation, development, differentiation, gene amplification, DNA recombination, chromosomal segregation and cellular senescence  and is called the "guardian of the genome" . Defects in the p53 tumour suppressor gene have been linked to more than 50% of human cancers . Recently, Avery-Kieida et al reported that some target genes of p53 involved in apoptosis and cell cycle regulation are aberrantly expressed in melanoma cells, leading to abnormal activity of p53 and contributing to the proliferation of these cells . In a mouse model with an N-terminal deletion mutant of p53 (Δ122p53) that corresponds to Δ133p53, Slatter et al demonstrated that these mice had decreased survival, a different and more aggressive tumor spectrum, a marked proliferative advantage on cells, reduced apoptosis and a profound proinflammatory phenotype . In addition, it has been found that when the p53 mutant was silenced, such down-regulation of mutant p53 expression resulted in reduced cellular colony growth in human cancer cells, which was found to be due to the induction of apoptosis . The inhibitor of apoptosis proteins are a group of structurally and functionally similar proteins that regulate apoptosis, cytokinesis and signal transduction. They are characterised by the presence of a baculovirus IAP repeat (BIR) protein domain . To date eight IAPs have been identified, namely, NAIP (BIRC1), c-IAP1 (BIRC2), c-IAP2 (BIRC3), X-linked IAP (XIAP, BIRC4), Survivin (BIRC5), Apollon (BRUCE, BIRC6), Livin/ML-IAP (BIRC7) and IAP-like protein 2 (BIRC8) . IAPs are endogenous inhibitors of caspases and they can inhibit caspase activity by binding their conserved BIR domains to the active sites of caspases, by promoting degradation of active caspases or by keeping the caspases away from their substrates . Dysregulated IAP expression has been reported in many cancers. For example, Lopes et al demonstrated abnormal expression of the IAP family in pancreatic cancer cells and that this abnormal expression was also responsible for resistance to chemotherapy. Among the IAPs tested, the study concluded that drug resistance correlated most significantly with the expression of cIAP-2 in pancreatic cells . On the other hand, Livin was demonstrated to be highly expressed in melanoma and lymphoma [52, 53] while Apollon, was found to be upregulated in gliomas and was responsible for cisplatin and camptothecin resistance . Another IAP, Survivin, has been reported to be overexpressed in various cancers. Small et al. observed that transgenic mice that overexpressed Survivin in haematopoietic cells were at an increased risk of haematological malignancies and that haematopoietic cells engineered to overexpress Survivin were less susceptible to apoptosis . Survivin, together with XIAP, was also found to be overexpressed in non-small cell lung carcinomas (NSCLCs) and the study concluded that the overexpression of Survivin in the majority of NSCLCs together with the abundant or upregulated expression of XIAP suggested that these tumours were endowed with resistance against a variety of apoptosis-inducing conditions . The caspases can be broadly classified into two groups: 1) those related to caspase 1 (e.g. caspase-1, -4, -5, -13, and -14) and are mainly involved in cytokine processing during inflammatory processes and 2) those that play a central role in apoptosis (e.g. caspase-2, -3. -6, -7,-8, -9 and -10). The second group can be further classified into 1) initiator caspases (e.g. caspase-2, -8, -9 and -10) which are primarily responsible for the initiation of the apoptotic pathway and 2) effector caspases (caspase-3, -6 and -7) which are responsible in the actual cleavage of cellular components during apoptosis . As mentioned in Section 2.2, caspases remain one of the important players in the initiation and execution of apoptosis. It is therefore reasonable to believe that low levels of caspases or impairment in caspase function may lead to a decreased in apoptosis and carcinogenesis. In one study, downregulation of caspase-9 was found to be a frequent event in patients with stage II colorectal cancer and correlates with poor clinical outcome . In another study, Devarajan et al observed that caspases-3 mRNA levels in commercially available total RNA samples from breast, ovarian, and cervical tumuors were either undetectable (breast and cervical) or substantially decreased (ovarian) and that the sensitivity of caspase-3-deficient breast cancer (MCF-7) cells to undergo apoptosis in response to anticancer drug or other stimuli of apoptosis could be enhanced by restoring caspase-3 expression, suggesting that the loss of caspases-3 expression and function could contribute to breast cancer cell survival . In some instances, more than one caspase can be downregulated, contributing to tumour cell growth and development. In a cDNA array differential expression study, Fong et al observed a co-downregulation of both capase-8 and -10 and postulated that it may contribute to the pathogenesis of choriocarcinoma . Several abnormalities in the death signalling pathways that can lead to evasion of the extrinsic pathway of apoptosis have been identified. Such abnormalities include downregulation of the receptor or impairment of receptor function regardless of the mechanism or type of defects, as well as a reduced level in the death signals, all of which contribute to impaired signalling and hence a reduction of apoptosis. For instance, downregulation of receptor surface expression has been indicated in some studies as a mechanism of acquired drug resistance. A reduced expression of CD95 was found to play a role in treatment-resistant leukaemia  or neuroblastoma  cells. Reduced membrane expression of death receptors and abnormal expression of decoy receptors have also been reported to play a role in the evasion of the death signalling pathways in various cancers . In a study carried out to examine if changes in death ligand and death receptor expression during different stages of cervical carcinogenesis were related to an imbalance between proliferation and apoptosis, Reesink-Peters et al concluded that the loss of Fas and the dysregulation of FasL, DR4, DR5, and tumor necrosis factor-related apoptosis-inducing ligand (TRAIL) in the cervical intraepithelial neoplasia (CIN)-cervical cancer sequence might be responsible for cervical carcinogenesis . Like a double-edged sword, every defect or abnormality along the apoptotic pathways may also be an interesting target of cancer treatment. Drugs or treatment strategies that can restore the apoptotic signalling pathways towards normality have the potential to eliminate cancer cells, which depend on these defects to stay alive. Many recent and important discoveries have opened new doors into potential new classes of anticancer drugs. This Section emphasises on new treatment options targeting some of the apoptotic defects mentioned in Section 3. A summary of these drugs and treatment strategies is given in Table 2. First report on the use of a wild-type p53 gene containing retroviral vector injected into tumour cells of non-small cell lung carcinoma derived from patients. The use of p53-based gene therapy was reported to be feasible. Some potential treatment strategies used in targeting the Bcl-2 family of proteins include the use of therapeutic agents to inhibit the Bcl-2 family of anti-apoptotic proteins or the silencing of the upregulated anti-apoptotic proteins or genes involved. One good example of these agents is the drug oblimersen sodium, which is a Bcl-2 antisence oblimer, the first agent targeting Bcl-2 to enter clinical trial. The drug has been reported to show chemosensitising effects in combined treatment with conventional anticancer drugs in chronic myeloid leukaemia patients and an improvement in survival in these patients [66, 67]. Other examples included in this category are the small molecule inhibitors of the Bcl-2 family of proteins. These can be further divided into: 1) those molecules that affect gene or protein expression and 2) those acting on the proteins themselves. Examples for the first group include sodium butyrate, depsipetide, fenretinide and flavipirodol while the second group includes gossypol, ABT-737, ABT-263, GX15-070 and HA14-1 (reviewed by Kang and Reynold, 2009 ). Some of these small molecules belong to yet another class of drugs called BH3 mimetics, so named because they mimic the binding of the BH3-only proteins to the hydrophobic groove of anti-apoptotic proteins of the Bcl-2 family. One classical example of a BH3 mimetic is ABT-737, which inhibits anti-apoptotic proteins such as Bcl-2, Bcl-xL, and Bcl-W. It was shown to exhibit cytotoxicity in lymphoma, small cell lung carcinoma cell line and primary patient-derived cells and caused regression of established tumours in animal models with a high percentage of cure . Other BH3 mimetics such as ATF4, ATF3 and NOXA have been reported to bind to and inhibit Mcl-1 . Rather than using drugs or therapeutic agents to inhibit the anti-apoptotic members of the Bcl-2 family, some studies have demonstrated that by silencing genes coding for the Bcl-2 family of anti-apoptotic proteins, an increase in apoptosis could be achieved. For example, the use of Bcl-2 specific siRNA had been shown to specifically inhibit the expression of target gene in vitro and in vivo with anti-proliferative and pro-apoptotic effects observed in pancreatic carcinoma cells . On the other hand, Wu et al demonstrated that by silencing Bmi-1 in MCF breast cancer cells, the expression of pAkt and Bcl-2 was downregulated, rendering these cells more sensitive to doxorubicin as evidenced by an increase in apoptotic cells in vitro and in vivo. Many p53-based strategies have been investigated for cancer treatment. Generally, these can be classified into three broad categories: 1) gene therapy, 2) drug therapy and 3) immunotherapy. The first report of p53 gene therapy in 1996 investigated the use of a wild-type p53 gene containing retroviral vector injected into tumour cells of non-small cell lung carcinoma derived from patients and showed that the use of p53-based gene therapy may be feasible . As the use of the p53 gene alone was not enough to eliminate all tumour cells, later studies have investigated the use of p53 gene therapy concurrently with other anticancer strategies. For example, the introduction of wild-type p53 gene has been shown to sensitise tumour cells of head and neck, colorectal and prostate cancers and glioma to ionising radiation . Although a few studies managed to go as far as phase III clinical trials, no final approval from the FDA has been granted so far . Another interesting p53 gene-based strategy was the use of engineered viruses to eliminate p53-deficient cells. One such example is the use of a genetically engineered oncolytic adenovirus, ONYX-015, in which the E1B-55 kDa gene has been deleted, giving the virus the ability to selectively replicate in and lyse tumour cells deficient in p53 . Several drugs have been investigated to target p53 via different mechanisms. One class of drugs are small molecules that can restore mutated p53 back to their wild-type functions. For example, Phikan083, a small molecule and carbazole derivative, has been shown to bind to and restore mutant p53 . Another small molecule, CP-31398, has been found to intercalate with DNA and alter and destabilise the DNA-p53 core domain complex, resulting in the restoration of unstable p53 mutants . Other drugs that have been used to target p53 include the nutlins, MI-219 and the tenovins. Nutlins are analogues of cis-imidazoline, which inhibit the MSM2-p53 interaction, stabilise p53 and selectively induce senescence in cancer cells  while MI-219 was reported to disrupt the MDM2-p53 interaction, resulting in inhibition of cell proliferation, selective apoptosis in tumour cells and complete tumour growth inhibition . The tenovins, on the other hand, are small molecule p53 activators, which have been shown to decrease tumour growth in vivo. Several clinical trials have been carried out using p53 vaccines. In a clinical trial by Kuball et al, six patients with advanced-stage cancer were given vaccine containing a recombinant replication-defective adenoviral vector with human wild-type p53. When followed up at 3 months post immunisation, four out of the six patients had stable disease. However, only one patient had stable disease from 7 months onwards . Other than viral-based vaccines, dendritic-cell based vaccines have also been attempted in clinical trials. Svane et al tested the use of p53 peptide pulsed dendritic cells in a phase I clinical trial and reported a clinical response in two out of six patients and p53-specific T cell responses in three out of six patients . Other vaccines that have been used including short peptide-based and long peptide-based vaccines (reviewed by Vermeij R et al., 2011 ). When designing novel drugs for cancers, the IAPs are attractive molecular targets. So far, XIAP has been reported to be the most potent inhibitor of apoptosis among all the IAPs. It effectively inhibits the intrinsic as well as extrinsic pathways of apoptosis and it does so by binding and inhibiting upstream caspase-9 and the downstream caspases-3 and -7 . Some novel therapy targeting XIAP include antisense strategies and short interfering RNA (siRNA) molecules. Using the antisense approach, inhibition of XIAP has been reported to result in an improved in vivo tumour control by radiotherapy . When used together with anticancer drugs XIAP antisense oligonucleotides have been demonstrated to exhibit enhanced chemotherapeutic activity in lung cancer cells in vitro and in vivo. On the other hand, Ohnishi et al reported that siRNA targeting of XIAP increased radiation sensitivity of human cancer cells independent of TP53 status  while Yamaguchi et al reported that targeting XIAP or Survivin by siRNAs sensitise hepatoma cells to death receptor- and chemotherapeutic agent-induced cell death . Many studies have investigated various approaches targeting Survivin for cancer intervention. One example is the use of antisense oligonucleotides. Grossman et al was among the first to demonstrate the use of the antisense approach in human melanoma cells. It was shown that transfection of anti-sense Survivin into YUSAC-2 and LOX malignant melanoma cells resulted in spontaneous apoptosis in these cells . The anti-sense approach has also been applied in head and neck squamous cell carcinoma and reported to induce apoptosis and sensitise these cells to chemotherapy  and in medullary thyroid carcinoma cells, and was found to inhibit growth and proliferation of these cells . Another approach in targeting Survivin is the use of siRNAs, which have been shown to downregulate Survivin and diminish radioresistance in pancreatic cancer cells , to inhibit proliferation and induce apoptosis in SPCA1 and SH77 human lung adenocarcinoma cells , to suppress Survivin expression, inhibit cell proliferation and enhance apoptosis in SKOV3/DDP ovarian cancer cells  as well as to enhance the radiosensitivity of human non-small cell lung cancer cells . Besides, small molecules antagonists of Survivin such as cyclin-dependent kinase inhibitors and Hsp90 inhibitors and gene therapy have also been attempted in targeting Survivin in cancer therapy (reviewed by Pennati et al., 2007 ). Other IAP antagonists include peptidic and non-peptidic small molecules, which act as IAP inhibitors. Two cyclopeptidic Smac mimetics, 2 and 3, which were found to bind to XIAP and cIAP-1/2 and restore the activities of caspases- 9 and 3/-7 inhibited by XIAP were amongst the many examples . On the other hand, SM-164, a non-peptidic IAP inhibitor was reported to strongly enhance TRAIL activity by concurrently targeting XIAP and cIAP1 . Several drugs have been designed to synthetically activate caspases. For example, Apoptin is a caspase-inducing agent which was initially derived from chicken anaemia virus and had the ability to selectively induce apoptosis in malignant but not normal cells . Another class of drugs which are activators of caspases are the small molecules caspase activators. These are peptides which contain the arginin-glycine-aspartate motif. They are pro-apoptotic and have the ability to induce auto-activation of procaspase 3 directly. They have also been shown to lower the activation threshold of caspase or activate caspase, contributing to an increase in drug sensitivity of cancer cells . In addition to caspase-based drug therapy, caspase-based gene therapy has been attempted in several studies. For instance, human caspase-3 gene therapy was used in addition to etoposide treatment in an AH130 liver tumour model and was found to induce extensive apoptosis and reduce tumour volume  while gene transfer of constitutively active caspse-3 into HuH7 human hepatoma cells selectively induced apoptosis in these cells . Also, a recombinant adenovirus carrying immunocaspase 3 has been shown to exert anti-cancer effects in hepatocellular carcinoma in vitro and in vivo. Recently, many new molecules that target apoptosis enter various stages of clinical trials. A search at http://www.clinicaltrials.gov (a registry and results database of federally and privately supported clinical trials conducted in the United States and around the world) returns many results. These molecules target various proteins involved in apoptosis. Many are antagonists of IAPs and molecules that target the Bcl-2 family of proteins. Table 3 summarises ongoing or recently completed clinical trials involving molecules that target apoptosis. The abundance of literature suggests that defects along apoptotic pathways play a crucial role in carcinogenesis and that many new treatment strategies targeting apoptosis are feasible and may be used in the treatment of various types of cancer. Some of these discoveries are preclinical while others have already entered clinical trials. Many of these new agents or treatment strategies have also been incorporated into combination therapy involving conventional anticancer drugs in several clinical trials, which may help enhance currently available treatment modalities. However, some puzzling and troubling questions such as whether these treatment strategies induce resistance in tumours and whether they will cause normal cells to die in massive numbers still remain unanswered. This is a true concern if lessons were to be learnt from the conventional anticancer drugs, which wipe out both normal cells and tumour cells and cause brutal side effects and tumour resistance. On the other hand, it would be of clinical benefit, if these molecules that target apoptosis are specifically acting on a single pathway or protein. However, most of the molecules that enter clinical trials act on several targets and these include many inhibitors of the Bcl-family of proteins and some pan-IAP inhibitors. Hence, evidence-based long-term follow ups on patients receiving these new cancer treatments are needed and ongoing research should focus on those strategies that can selectively induce apoptosis in malignant cells and not the normal ones. The author would like to acknowledge the International Medical University, Malaysia for funding research that led to the writing of this work (grant number: 231/2011). RSYW contributed solely to the writing and submission of this work.